Artificial Intelligence (AI) has sparked a data revolution that is changing our world forever. It’s a time of great disruption but great opportunity in the manufacturing industry, as businesses seek to find novel ways to create new business value, empower and upskill their workforce, optimize their operations and innovate for a sustainable future. Advanced technologies like AI, mixed reality and automation are helping drive Industry 4.0, creating a future where “intelligent manufacturing” is a reality. Introducing Dynamics 365 mixed reality applications for HoloLens 2 and mobile devices. Today, we are introducing updates that help bring this reality even closer for our customers and partners, to deliver increased security, productivity and efficiency, which will help them achieve new business outcomes. Dynamics 365 Guides for HoloLens devices. • Azure is now the first major public cloud with end-to-end security for IoT for your devices, hubs and cloud resources. Azure Security Center for IoT can now be used to implement security best practices and mitigate threats across entire IoT projects including hubs, compute and data. Azure Sentinel, the first cloud-native security information and event management (SIEM) offering, can now protect the entire enterprise from threats including those affecting IoT devices. Azure IOT Hub now integrates with Azure Security Center for IoT to provide IoT security information directly inside the hub portal experience. • The introduction of OPC Twin and OPC Vault in our Azure Industrial IoT Cloud Platform solution, which respectively provide manufacturers a digital twin of their OPC UA-enabled machines and significantly enhance security and certification management. We’re also announcing important enhancements to the Connected Factory solution accelerator, which now integrates with OPC Twin to greatly simplify the process of installing IoT Edge. • An expansion of Azure IP Advantage to IoT, which extends Azure IP Advantage benefits to Azure customers with IoT devices connected to Azure, and devices that are powered by Azure Sphere and Windows IoT. Additionally, qualified startups who join the LOT Network have the ability to acquire Microsoft patents through LOT for free. Microsoft customers on their digital transformation journey. You’ll find more details on the Azure IoT Platform updates from Sam George, and more information on Azure IP Advantage below. Dynamics 365 for Finance and Operations helps businesses adapt quickly to changing market demands and drive rapid business growth. 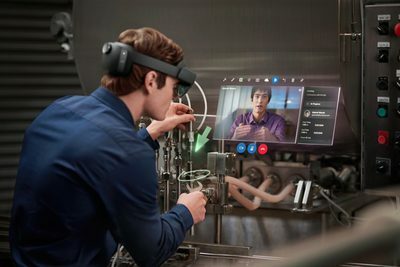 • Intelligent innovations for industry: Onsite at Hannover Messe we will showcase our wide range of offerings for manufacturers including breakthroughs in AI experiences, mixed reality with HoloLens 2, business-ready solutions with Dynamics 365 and tools to close the skills gap with Microsoft 365. • Customers achieving business outcomes: We’re supporting leading manufacturers including Bühler, Electrolux, Siemens Gamesa and ZEISS as they accelerate their own innovations. New partner solutions: We continue to grow the ecosystem of partners collaborating with Microsoft to help manufacturers succeed, with several announcing news this week. • The latest in our Future Computed book series: The Future Computed: AI and Manufacturing explores the way manufacturers from across the world are embracing AI. It shares insights from our customers on the importance of creating the right company culture and talent pipeline to realize AI’s potential, and explores the role of public policy in addressing labor market disruption and fostering the ethical use of AI. We’ll preview the book’s key themes at Hannover Messe ahead of its release in May. • More than 25 innovative companies will join us in our Hannover Messe booth to showcase how we are working together to harness IoT, mixed reality, AI and other key technologies that revolutionize manufacturing. Today we are sharing details about a series of new product and program advancements for the manufacturing industry prior to Hannover Messe. 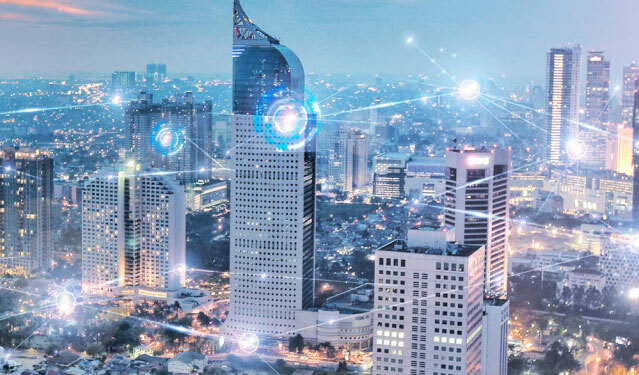 The complexity and scale of the IoT and Industrial IoT (IIot) challenge is reinforced by leading market research firms estimating there will be over 20 billion installed end-point devices worldwide by 2020 — each of which pose a potential security risk. While some cloud providers address pieces of this puzzle, Azure is the world’s first cloud offering to deliver an end to end, unified approach to IoT security. Transforming manufacturing with intelligent business applications. Digital transformation is upon us, and every industry and every business is part of it. With Azure Security Center for IoT, customers can find missing security configurations across IOT devices, the edge and cloud. For example, they can check which ports are open on their IOT devices, confirm their SQL database is encrypted and act to remediate any issues. Azure Security Center for IoT protects from ever-evolving threats, drawing upon the vast threat intelligence information in the Microsoft Intelligent Security Graph, which analyzes six trillion signals per day. This means manufacturers can take advantage of a single view of security across all their Azure solutions — including Azure IoT solutions, from edge devices to applications — using hundreds of built-in security assessments in a central dashboard. With Azure Sentinel, users can hunt for or respond to active threats spanning the entire enterprise from IOT devices to Azure to Office 365 and on-premise systems. SecOps teams now have the right tools to reduce the surface attack of IoT solutions, remediate issues before they become serious, prevent attacks with machine learning and gain significant value from simplifying threat detection and security posture management for entire IoT deployments. 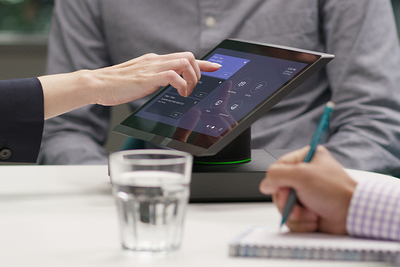 Combining these new offerings with previously announced device security offerings such as Azure Sphere, customers will have access to IoT innovation with the confidence of end-to-end security that only Microsoft provides – spanning devices, the edge and cloud. You’ll find more information here. Toyota’s North America Production Engineering team uses Dynamics 365 Layout and Dynamics 365 Remote Assist on Microsoft HoloLens in their North America manufacturing centers. In a connected factory, all machines communicate with each other, leveraging data, IoT and automation to monitor and control all aspects of production. We’ve enhanced our offering for these Industrial IoT scenarios by developing components that simplify and secure our customers’ digital operations. At our booth at Hannover Messe, we’ll be showcasing OPC Twin, which creates a digital twin for your OPC UA-enabled machines and makes the information model of that specific machine available in the cloud. Customers can control and manage their OPC Twins directly from the cloud by using microservices running on Azure. Intelligent field service at Hannover Messe. In addition, we’ll showcase our progress in security with OPC Vault. OPC Vault automates security management by creating, managing and revoking certificates for your OPC UA servers on a global scale. Both components provide simplicity and security for your industrial IoT solutions and are fully open source and available on GitHub. We also understand the importance of simplicity and speed in getting started with a proof-of-concept for Industrial IoT scenarios. For that purpose, we continue to enhance the Connected Factory solution accelerator, which is designed to accelerate proof-of-concepts in Industrial IoT and additionally offers OEE data across customers’ factories via a centralized dashboard. Today, Connected Factory integrates with an OPC Twin dashboard and empowers manufacturers to streamline the process of getting started with Industrial IoT and generating insights from their digital operations. Growing the Microsoft and Adobe cloud partnership. As businesses become more connected, security remains paramount to success. Microsoft is taking end-to-end security one step further for our customers to protect their data and intellectual property. The Microsoft Azure IP Advantage program now includes new benefits for Azure IoT innovators and startups. We first announced Azure IP Advantage in February, 2017, to provide comprehensive protection against intellectual property (IP) risks for our cloud customers. We are now expanding the program to customers who are innovating in IoT and at the edge to do predictive maintenance, manage digital and physical assets, and improve overall efficiency, safety and quality of products - all of which create massive volumes of data and unique business innovations. Walk the site without being on location. • Uncapped indemnification coverage for Microsoft’s Azure Sphere and Windows IoT. • Access to 10,000 patents for customers using Azure to power IoT devices to defend themselves against IP lawsuits. • The ability for startups on Azure to acquire Microsoft patents for free. Now available on mobile devices. Technicians can work from anywhere on the devices they already use. Remote Assist for mobile devices is now available in preview on Android. In addition to the expanded program, we also joined the Open Invention Network and the LOT (license on transfer) Network last year to help address patent assertion risk for our customers and partners. Taken together, we believe Microsoft offers the most comprehensive, end-to-end framework for addressing IP risks in the cloud. More detail can be found in this Microsoft on the Issues blog. Customers are leveraging Microsoft technology in their manufacturing operations and seeing real business results. • Bühler, one of the world’s largest providers of food processing solutions, is leveraging Microsoft blockchain technology to improve global food safety standards and reduce food poisoning rates, while increasing production efficiencies. • Electrolux, the Swedish home appliance manufacturer, launched a new Azure IoT smart connected air purifier and app in a matter of weeks with minimal R&D time. The Pure A9 removes ultra-fine dust particles, pollutants, bacteria, allergens and bad odors from indoor rooms. • Siemens Gamesa, the leader in renewable energy, is streamlining and automating how technicians inspect and maintain industrial wind turbines by migrating its autonomous drone-digital process to Microsoft Azure and infusing it with Azure AI. Integrating Azure AI services will greatly expedite the process, with image recognition reduced to 34 seconds, as opposed to 4 to 6 hours using the manual method, which also was prone to errors. • ZEISS teamed up with Microsoft to present a spectroscopy measurement and data sharing solution that connects the compact all-round spectrometer ZEISS Corona process with Microsoft Azure. By uploading production data from spectroscopic analysis to the cloud, clients get invaluable insights about their products and production – whenever and wherever they need it. The solution can be implemented in food production processes to monitor important quality indicators (e.g. fat, moisture, salt content) directly in the production line. This enables production managers to react immediately to process variations and helps to increase quality and productivity, while using raw materials and energy in a more efficient way at the same time. • Intel is working with Microsoft on a new modern industrial PC reference design for factories and industrial applications. Using the reference design, which will be available later this year, device partners can build fully provisioned and customized industrial PCs that can be connected to a range of devices to discover, manage and analyze data in real time, using AI on the machine or in the Azure cloud. JDA, a leading global supply chain company, will be showcasing its new Azure-based Luminate solution, which serves as an end-to-end crisis control center allowing companies to see, interpret, and act on real-time information from the entire supply chain and extended third-party digital ecosystem. Closing the skills gap in manufacturing with Microsoft 365. From the front office to supply chain to the factory floor, Microsoft solutions can help improve manufacturing operations by streamlining daily work, driving greater efficiency, safety and productivity as well as helping enhance employee performance. 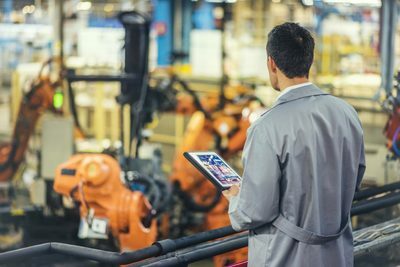 • Microsoft 365 is equipping organizations, including Firstline Workers on the factory floor with the skills and tools they need to keep up with digital manufacturing in a secure environment. Microsoft Teams is transforming how today’s manufacturing workforce collaborates and communicates securely. Learn more how Microsoft 365 is being used in manufacturing here. • Customers have a growing need to move cloud computing closer to the edge. 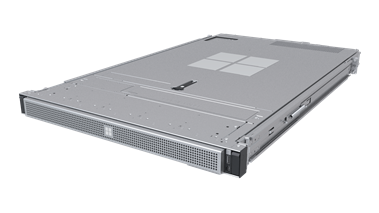 Azure Data Box Edge helps meet this need as a powerful, AI-enabled edge appliance that sits within a customer’s own environment – in their data center or on a factory floor – right alongside their existing hardware. It brings Azure computing power to where data originates, eliminating any network latency. 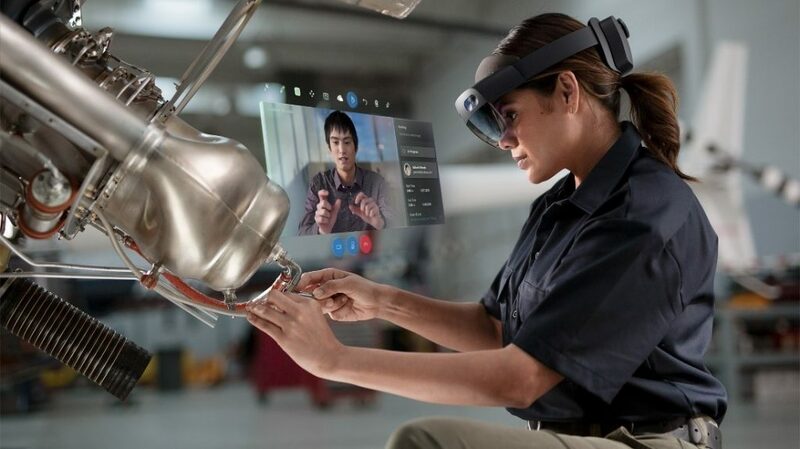 • With mixed reality applications Dynamics 365 Remote Assist and Layout, companies are using Microsoft HoloLens and HoloLens 2 to dramatically boost productivity, compliance and safety. You’ll find more information about a broad range of Dynamics 365 innovations in manufacturing here. Azure Data Box family meets customers at the Edge. • Available later this year, the new Microsoft Dynamics 365 Guides for HoloLens and HoloLens 2 will empower employees to learn by doing, with step-by-step instructions guiding them to the tools, parts and institutional knowledge they need in real work scenarios. Achieve more together with Microsoft Teams. Meet with teams of 10 or 10,000. Host audio, video, and web conferences with anyone inside or outside your organization or go big with live events. • Delivering a unified approach to financial and business operations across manufacturing, supply chain, distribution and retail is made easier by Dynamics 365 for Finance and Operations. • Intelligent, connected field service through Dynamics 365 Connected Field Service can help manufacturers quickly detect and resolve issues, leveraging connected devices and machine learning and in the process, driving efficiency and reducing costs. Extend Microsoft Teams with one-touch join to every meeting space with Microsoft Teams Rooms from our partners Logitech, Crestron, Polycom, Lenovo, HP and Yealink. Browse a list of Microsoft Teams Rooms for your meeting spaces. The future of manufacturing is all about applying new levels of intelligence across all aspects of operations, with disruption triggered by AI, mixed reality and IoT, redefining the value chain from engineering design to customer engagements to supply chains. We look forward to meeting with you to discuss how we’re empowering intelligent manufacturing around the world. 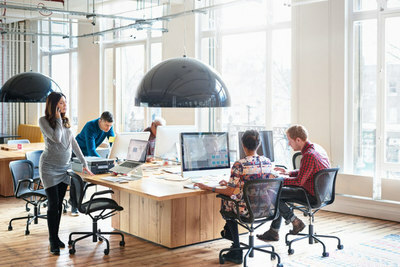 Startups have unique IP challenges, such as risk from non-practicing entities, which view small companies and startups as soft targets for patent lawsuits. Until then, please visit Microsoft at Hannover Messe 2019 for additional details about what’s planned, how to engage our team and where to find our booth in Hall 7, Stand C40.